Overlooking the idyllic Trou d'Eau Douce Bay, the Shangri-La's Le Touessrok Resort & Spa takes pride of place along a stunning stretch of beachfront, offering golfers visiting the paradise of Mauritius a supremely luxurious base for their stay, as well as easy access to Ile aux Cerfs which is home to one of the best golf courses in the country. This superb resort is an ideal destination for those who simply wish to lounge on the beach with nothing but the sound of the Indian Ocean lapping at the shore to distract them, but it also offers everything required by the more energetic traveller. Treat yourself to a day of pampering at the spa, take to the water and try your hands at adrenaline fuelled watersports, or venture away from the resort to explore the fascinating and beautiful surroundings. Situated just a 10 minute speedboat ride (the only way to access this course!) away from the resort, Ile aux Cerfs Golf Course, formerly known as Le Touessrok, takes pride of place on the island of the same name and is one of the most spectacular in Mauritius, which is high praise indeed considering the undeniable beauty and quality of many Mauritian courses. Surrounded on all sides by the crystal blue waters of the Indian Ocean, Ile aux Cerfs was laid down by Bernhard Langer and weaves its way through the island’s tranquil mangrove forests, making its way down to the heavenly sandy shoreline on several occasions throughout the round, and with top class conditioning assured throughout the year, the test of golf on offer will appeal to golfers of all abilities. 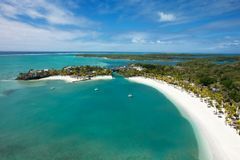 Bernhard Langer said of the course: "What I have aspired to create with Le Touessrok (Ile aux Cerfs) golf course is a golfing experience that truly arouses all the senses. From the amazing natural setting to the challenges presented by the course I want it to be a game to remember for all who play." Located on the East side of the island, the Shangri-La's Le Touessrok Resort & Spa is just 45 minutes from Sir Ramgoolam International Airport and offers golfers visiting Mauritius an excellent accommodation option for their stay on the island. All guestrooms and suites (200 in total) are located on the beachfront and offer unrivalled views out over the Indian Ocean through large bay windows. A number of rooms also boast private balconies; the perfect place to shake off the cobwebs in the morning, or indeed to enjoy a sun downer before heading out for an evening meal. No matter which standard of accommodation you opt for, whether it’s a Deluxe Ocean View Room, or the opulent Shangri-La Suite, everything you’d expect of a top class hotel is present and correct, ensuring a supremely comfortable stay. Luxury bathrooms featuring deep soaking tubs, designer amenities and a walk-in shower, as well as complimentary WiFi, satellite TV, mini bar, tea / coffee making facilities, king / queen size beds and luxury furnishings throughout come as standard in all rooms, while suites and villas boast more exclusive privileges such as champagne on arrival, as well as in some cases, direct access to the beach. For those looking for the ultimate in luxury and those travelling with the family and in need of extra living space and privacy, there are also three exclusive villas on resort too, each of which has its own private swimming pool and direct access to the beach, offering a perfectly personalised VIP island experience. Away from your room, as a guest of Shangri-La's Le Touessrok, you can enjoy complimentary water sports; including kayaking, paddle boarding, wake boarding, sailing, snorkeling, windsurfing and water skiing and further exciting activities such as big game fishing can be undertaken too, for varying additional fees. As you’d expect, dining options are extensive too, with no less than 5 on-site restaurants to choose from. Enjoy cuisine of the highest quality, taking in flavours from the western world, as well as India and Japan too. In search of a well deserved cocktail in the heat of the day or even a pre-dinner aperitif? The Republik and Sega Bars are always on hand to whet your whistle. The CHI Spa, with its 8 treatment rooms and superb array of facilities is the perfect place to head if you need to wash away the stresses and strains of everyday life, while more adventurous guests will revel in the chance to explore the two picture perfect islands that lie just off shore. Head to Ilot Mangenie to embrace the peaceful isolation, or to Ile aux Cerfs where of course you can enjoy a round of golf at its stunning Bernhard Langer designed golf course.